The wiring diagram posted now is about the 1994 Mazda RX-7's central processing unit and theft deterrent system. Before doing any wiring works on 1994 Mazda RX-7, it is suggested to you for understanding the wiring diagram shown in the following attached picture. This diagram shows you the detail wiring line of the CPU & theft deterrent system of the 1994 Mazda RX-7. 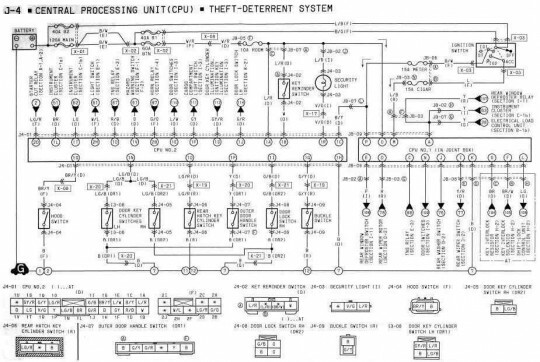 Check this wiring diagram of 1994 Mazda RX-7's central processing unit and theft deterrent system. Just click the picture for larger view.